There are flashes of terrific character stuff, too: Lance is restored to detective status and handed back his badge, a moment that feels genuinely earned. Laurel inspires Sara with a lovely, evocative line (“If you’re that far gone, and so irredeemable, why would they know you by such a beautiful name?”) while Felicity restores Oliver’s mojo with the five simple words “I still believe in you”. And Sara gets to be a textbook superhero, at last, rescuing a kid from a burning building. “Who was that?” asks the mother, in a moment that edges perilously close to cheese but where the cliché ultimately ends up resonating with the power of comic book myth. Malcolm’s back, of course. John Barrowman brings some surprising new colours to him, too: he’s noble, just a little vulnerable. And, if we’re to believe the shocking closing seconds, newly dead. TRIVIA: Ah, the mysterious Arrow/Springsteen connection continues… Last season gave us an episode named for Bruce’s 1978 album Darkness On The Edge Of Town . Streets Of Fire is a track on that LP and also inspired Walter Hill’s 1984 movie of the same name. DID YOU SPOT? : The intersection of “5 th & Adams” is a nod to legendary DC artist Neal Adams. Best known for his gothic revamping of Batman in the late ‘60s he also drew the politically provocative Green Arrow/Green Lantern series in the ‘70s. DID YOU SPOT? 2: Monument Point is a locale in the DCU, first seen in Justice Society Of America Vol 3 No 44, where it suffered a catastrophic onslaught by the being known as Scythe. 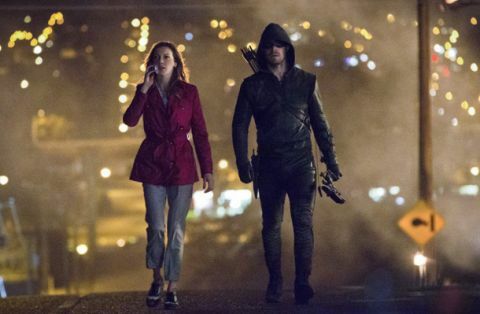 It’s the creation of Arrow producer Marc Guggenheim.